"On some turbulence after a good flight and around two o'clock we were in Kotha Baru in northeastern Malaysia. This state is a lot more Islamic than places we were before. For example, all signs (street names as well as store names) in both Malay Bahasa and in Arabic, each woman wears a headscarf and everyone covers clothing and there is no pork sold anywhere. Moreover, we were there on a Friday and that is rest day, so almost all stores close. Just did not think about it in advance ... We therefore walked to the market to eat something, but it was too filthy. Fortunately, there was still an Indian open, and although it only had two dishes that we could choose from, we at least had something to eat. After lunch we walked through the town and we passed a kind of weekend market, with tasty snacks, yes. now we had just eaten." 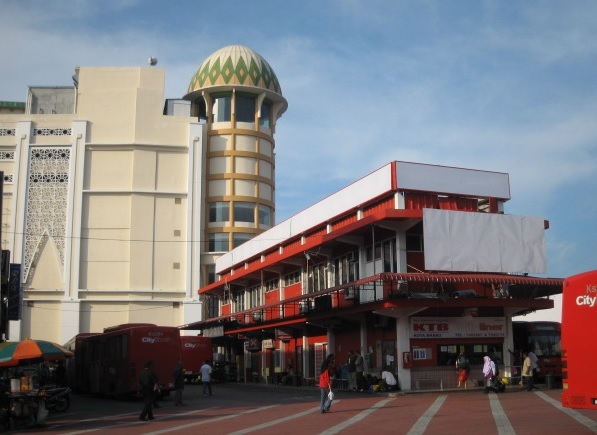 Kota Bharu (also: KB, Kota Bahru or Kota Baru) is the capital of Kelantan. Kota Bharu means "new castle" and is located on the east coast of the peninsula of Malaysia. Many travelers want to travel from KB to the Perhentian Islands. This bus ride takes about one and a half hours. Kota Bharu is a very socially-conservative city in a state ruled by the Islamic Party of Malaysia (PAS). Be respectful of the cultural and religious sensibilities of the mainly Muslim inhabitants. Central Bus Station - from here city and intercity buses leave. Usually the passengers of long distance buses get out of here. Langgar bus terminal - city, regional buses and long distance buses depature here. Stesen Bas Kota Bharu behind Tesco Kota Bharu (or next to the new AEON shopping center in Kota Bharu). This is the long-distance express bus station. Stesen Bas Kota Bharu in Malay is located at the Jalan Pendek just 4 km away from the center at the lively market Pasar Besar Siti Khadijah, behind Tesco Kota Bharu or next to the new AEON shopping center. At the bridge over the river Sungai Kelatan north of Kota Bharu. 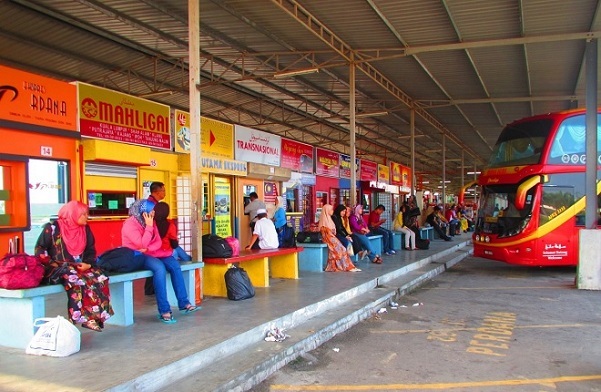 This bus station acts as the terminal for the majority of the long distance buses that enter and leave Kota Bharu. The bus station is intended for local buses to connect routes with neighboring cities. Travelers can take direct bus services to the ferry in Kuala Besut to board the boat to the Perhentian islands, or via the Rantau Panjang to Sungai Kolok on the border with Thailand. Around the bus station (terminal) you will find plenty of amenities in the area, such as restaurants, shops and sleeping accommodation. There are quite a few bus operators (Prime Express, Mahligai Exress, Transnasional, Sani Express), who operate daily buses between Kota Bharu and other locations on the peninsula of Malaysia. 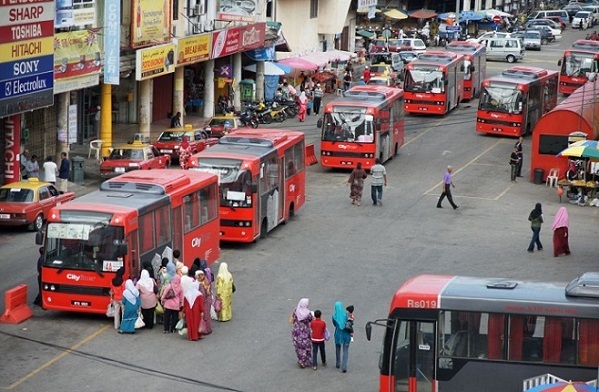 Many express bus operators use their bus routes to and from the bus station of Kota Bharu. Most long distance buses leave from this station. Three bus stations in KB can lead to confusion for both passengers and booking agencies, which are usually located in the bus station. It is even more complicated if you know that some night buses to Penang depart from the Central Bus Station. Tip: If you plan to take a long distance bus from Kota Bharu, you should always go to the nearest of the two bus stations in Kota Bharu to check which bus station for the bus you have booked. Transnasional is easiest to travel with, as it has ticket offices at all bus stations. Bus # 639 from the Central Bus Station runs between Kuala Besut and Kota Bharu and departs from Kota Bharu at 08:00, 09:30, 10:30, 13:00, 14:00 and 16:00. The ride costs about 10 ringgit and takes about 90 minutes. Please note that if you take the bus from 16:00, you will miss the last official boat to the Perhentians and therefore have to stay overnight in Kuala Besut. Although there are many hotels in Kuala Besut, we think Kota Bharu is a better place to stay. You can book a bus ticket with a seat reservation by clicking on the banner below. So you are always sure of a place.